Remember the first time you bought something really expensive? Maybe you’re thinking of that stereo you saved up for when you were 10 or the used car you paid cash for when you turned 18. Or maybe it was signing a loan for your college education. Whatever it is you’re thinking of, it probably seemed overwhelming at the time. You likely spent months saving or deciding what your best options were and when it came time to finally commit, you were bursting with excitement. Buying a home isn’t much different. It requires careful thought, planning, and saving. And whether it’s your first time buying a home or your tenth (which it may be since you're military and move every few years), the rules seem to change. The process remains the same, but the variables like location, the seller, and the market shift around you, which can make every time you buy a home kind of like the first. So, let’s talk tips. How can you make this home buying process your most successful one yet? Understanding national real estate trends and the local housing market can help you make a wise decision when it comes to buying a home. It’s no secret that the housing market fluctuates, which means there are good times to buy and there are bad times. Doing your research to know what the market is like (not just national, but locally, too) will help set you up for success when it comes time to buying a home. Recent trends. Last year, the market was dominated by millennials. Housing options were limited and prices were high. 2018 market. The market isn’t fluctuating like the recent trends we’ve seen. In fact, we can expect to see affordability and availability decline, the cost of homes and mortgage rates increase, and properties sell fast (spending an average of 63 days on the market). And the rest of the year looks just as bleak. And while this looks really appealing to sellers, it’s not so great news for buyers. With competition high, you’ll likely need to reassess your budget, get pre-approved early to show sellers that you’re serious, and maybe even write a personal letter to help you stand out among the crowd. Private Mortgage Insurance. But it’s not just the fluctuating cost of homes that home buyers should be aware of. With a more expensive home comes a more expensive down payment—if you want to avoid paying for Private Mortgage Insurance. Mortgage rates recently exceeded their highest levels for the past seven years when they reached nearly 5% this year. So unless you choose a VA Home Loan or can pay 20% down on a conventional loan, you may wind up paying 0.3 to 1.5% of the original loan amount in insurance. Having the right expert on your side can give you an edge when purchasing a home. Not only will they have extensive knowledge of the area and available housing, but they’ll be able to help you find a home tailored to your needs and assist you in making an offer, negotiating, and closing. Talk to friends. Get recommendations from friends who recently purchased a home in the area you’re looking to buy. Be sure to use resources like MilitaryByOwner’s business directory to find professionals in the area. Understand their skills. Not only should your agent be technologically literate, but they should also demonstrate great communication skills. Ask about professional certifications. While it’s okay to trust your gut, it’s also a good idea to verify professional licensing and certifications. 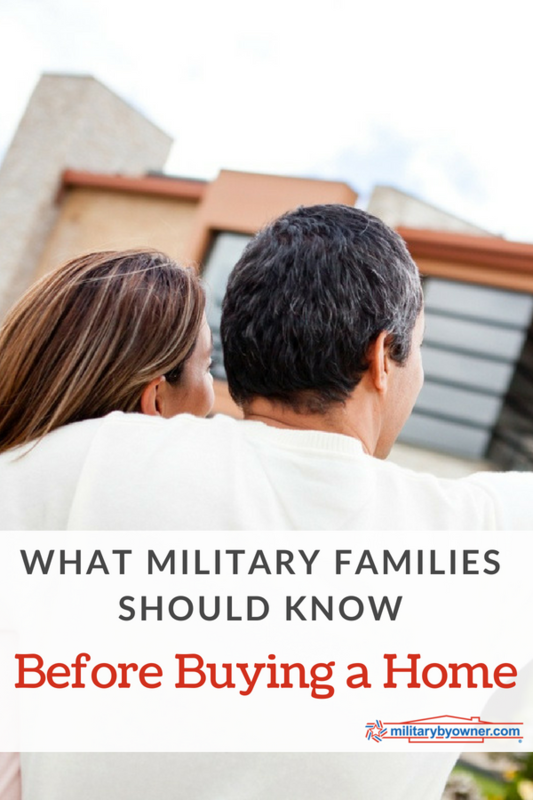 One to specifically watch for is the Military Relocation Professional (MRP) certification, which leads to the next point. Pass a final exam with a score of 80% or higher. When working with a buyer’s agent, you’ll be asked to sign a buyer’s agreement. But not all buyers' agreements are created equal. In fact, there are three main types of agreements and it’s a good idea to become familiar with them before signing anything. Short-term: A short-term buyer’s agreement typically lasts for a couple months, describes each party’s responsibilities, states that no compensation is owed to the agent, the buyer can work with additional agents, and that either party can break the contract at any time. Non-exclusive: Like the other buyer’s agreements, a non-exclusive agreement outlines the agent’s and the buyer’s responsibilities. However, the buyer is free to work with other agents and is only required to pay commission to the contracted buyer agent if they found the home that the buyer purchased. Exclusive: Is typically written for months or even a year. It outlines the responsibilities of both parties and states that the buyer cannot hire additional agents. It also says that the agent must be paid commission upon purchase of home (whether that’s the buyer or even the seller). Even though you can look at buying a home as just a financial transaction, it’s emotional. And while you should try to keep your feelings at bay when buying a home, it’s always a good idea to be sensitive to the seller’s emotions. They’re saying goodbye to a house filled with memories. And if you’ve ever been on that side of the equation, you know that those feelings can be overwhelming—understandably! So the first step to making the best offer, as shared in our free ebook Making an Offer and & Closing on Your New Home, is to know what motivates the seller. Is it the price, a quick turnover, or emotional attachment? Identifying where your home seller’s motivation lies will help you create a strategy for your interactions with them. For example, you might want to offer above asking price if they’re looking for the highest price. Or you might want to let them know that you’re pre-approved and make an offer with few contingencies to show them that you’re serious and want to seal the deal now. Or simply be likable. If the home seller is clearly emotional about the property, then it’s probably important to them that the home is going to a good family who will cherish it and make their own memories. When it comes time to submit a formal offer, you’ll start the paperwork side of this major transaction. If you’re working with an agent, this part will be fairly simple for you. You’ll discuss an appropriate offer to make and then they will write a formal purchase offer and present it to the seller’s agent or homeowner. But if you’re not using an agent, you’ll be expected to write up your own real estate purchase offer. Don’t worry, our partner U.S. Legal Forms is here to help you with that! Obviously, if your first offer isn’t accepted, you’ll want to be prepared to negotiate. But there’s more up for negotiation in a home sale than just the price tag. Things like repairs, appliances, closing costs, furniture, contingencies, warranty, leaseback, and length of time to close are all might be worth looking into. A few of the most common negotiations are repairs, closing costs, and contingencies. Ask the homeowner to fix the necessary repairs. Ask for credit. Since sellers are usually anxious to get moving, instead of asking for them to handle the repairs, ask that they provide a cash-back credit at escrow so you can then use the money to complete the repair yourself. Closing costs are typically anywhere from two to five percent of the home sale price, which translates to thousands of dollars. Coming up with a down payment plus closing costs can really strain your budget. A great way to earn some negotiating power on closing costs is to be ready to close quickly. Showing that you’re a serious buyer can settle an anxious homeowner and encourage them to work with you. A contingency means that an offer has been made and accepted, but the final sale is contingent on certain criteria being met. There are many different types of contingencies. The most common contingencies are the appraisal, home inspection, and mortgage approval. These also give you the chance to negotiate the necessary repairs that surfaced through the inspections. Once your offer is accepted by the sellers, you’ll put up a deposit for escrow. It’s at this time the seller should make you aware of any potential issues with the home. You’ll also get to review documents like flood maps, geological surveys, and private property ordinances. You’ll need to arrange for a home inspection. You’ll want to know that the nooks and crannies of this dwelling are as pleasing as the charming curb appeal. Your agent will have a professional in mind to inspect the residence. If there’s anything that doesn’t correlate with the seller’s disclosure statement, this is another opportunity for you to either cancel the deal or renegotiate the terms of the sale. Once you’re approved for the loan and everything you've agreed on is completed, you get to seal the deal! But first, you’ll want to do a final walk-through. This is a crucial step to ensure that everything is present and accounted for. It’s also the time to double check that everything (appliances, garage door, A/C, toilets, etc.) function properly if you haven’t already. Closing day itself involves a little paperwork and a hefty check, but overall, the day is pretty painless and exciting as you get to let out a sigh of relief that you have a new home. Just be sure that you switch out the locks immediately after receiving the keys—you never know who might have a spare! Feel ready to buy your next home? We hope so! With these tips in mind, we think you’ll be a huge success at finding a home near your next duty station. If you’re not sure where to start, hop on MilitaryByOwner's home page and browse the listings of homes for sale or rent. And if you have any questions or concerns, reach out to us and we’ll help you or point you in the right direction!